In this age of instant Internet celebrity, anyone can become famous for 15 seconds (to rework Andy Warhol’s oft-quoted maxim). But what does famous mean exactly when anyone can have a Facebook fan page—those public pages on Facebook set up by brands, media outlets, celebs, and wanna-be celebs. As it turns out, being popular is not as easy as it looks. A full 77 percent of Facebook fan pages have less than 1,000 fans, according to an upcoming report by Sysomos, a social media monitoring and analytics firm. 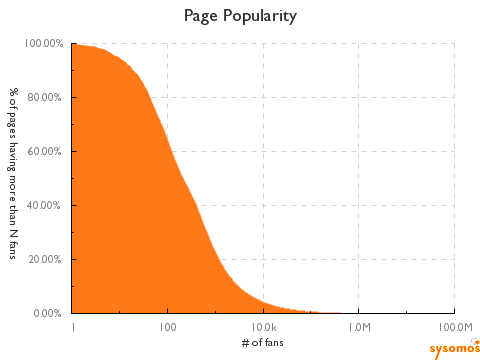 0.047% of pages have more than one million fans (297 in total). The Internet has long been defining celebrity down, and now we know by how much (if you accept that Facebook, the world’s fourth most popular Website with more than 300 million members, is as good a proxy as there is for the Web as a whole). To be Facebook famous, all you need is a moderately popular fan page, with the biggest chunk of those pages (42 percent) having between 100 and 1,000 fans. Another 30 percent have between 10 and 100 fans. 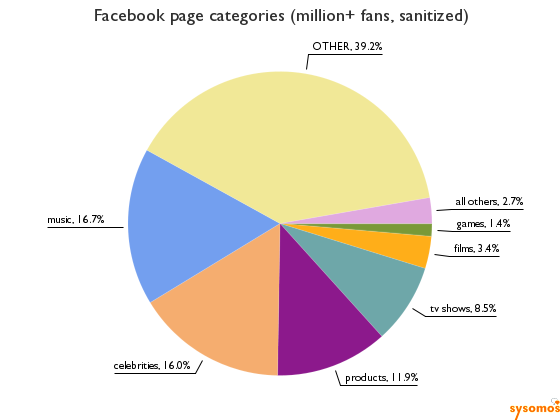 The categories Facebook fan pages fall into are remarkably evenly distributed. 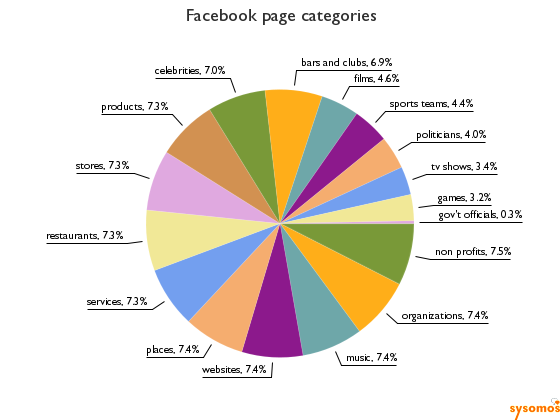 Celebrities, products, stores, restaurants, bars and clubs, websites, music, organizations, and non profits each make up between 6.9 percent and 7.5 percent of fan pages by category. So-called celebrities only make up 7 percent of all fan pages. Of course, there are also some real celebrities (both dead and alive) who attract massive followings to their Facebook fan pages. Okay, there’s only 297 of them. For instance, Michael Jackson has the biggest fan page with 10.4 million fans, and that’s not counting the probably-overlapping 4.7 million who are fans of R.I.P. Michael Jackson (We Miss You). The action movie star Vin Diesel clocks in at 7 million fans, which is more than Barack Obama (6.9 million) or Megan Fox (5 million). Yes, people on Facebook are idiots (Megan Fox is much hotter than Vin Diesel). In contrast, the most popular person on Twitter, Ashton Kutcher, has 4 million followers, and Obama’s Twitter account only has 2.75 million—although that’s without even trying. The biggest product page is Facebook’s own page, with 5.8 million fans (hey, is this rigged? ), followed by Starbucks with 5.1 million (the page is filled with wall comments such as, “MMMMM Pumpkin Spice Latte!”). Sysomos drilled down further, looked at the 297 pages with more than one million fans, and properly categorized them—or at least tried. It turns out many of them (39.2 percent) are uncharacterizable such as “Nights Out With Friends.” But the rest can be broken down into music (16.7 percent), celebrities 16.0 (percent), products (11.9 percent), TV shows (8.5 percent), films (3.4 percent), and games (1.4 percent). And that’s just like it is in the real world. If you have more than a million fans, chances are you are either a rock star or an actor. And unlike on Twitter, where popularity is correlated with how many times you Tweet, Facebook fan pages tend to be updated only once every 16 days. And that’s really the big difference between Facebook fans and Twitter followers. On Twitter, you follow someone because you want to hear what they have to say. On Facebook, you fan them just to show your support of affinity. Too often, it’s a throwaway gesture. But then, fame is fleeting.